If doctors told you to terminate your pregnancy not once but five times, you might take them at their word. But when Shelley and Rob Wall were advised to have an abortion after finding out that their baby had "no brain", they stuck to their guns. And six years on, their son Noah has defied the odds - by "growing" a brain. 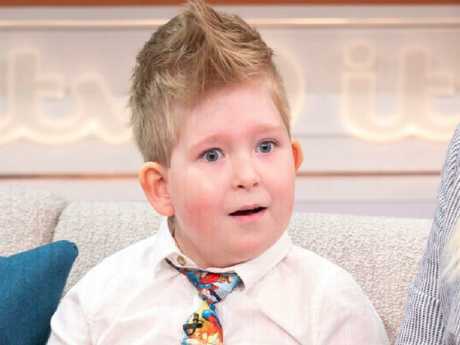 The Sun reports that the plucky youngster appeared on Good Morning Britain with his parents to share his extraordinary story, which Richard Madley called "a miracle". 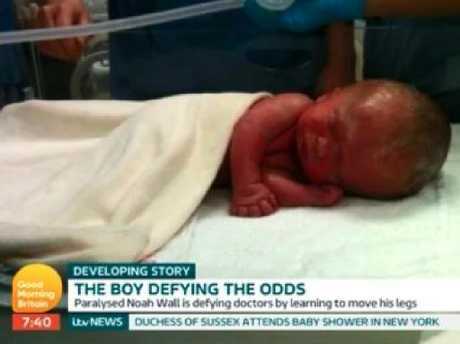 Before Noah was born, doctors doubted he'd survive. Mr and Mrs Wall have dedicated their time to his brain development and have taken him to Australia to a radical brain training centre. Here, he has learned how to sit up unaided and even managed to go surfing. The treatment that Noah's been having in Australia is called "neurophysics" - a mixture of physiotherapy and cognitive exercises. Mr Wall explained that the experts don't usually do give the therapy to kids because of the cognitive side of things but they were lucky enough to be able to persuade them to see and assess Noah and prepare them for when he's old enough to have that cognitive treatment. "It's all to do with the brain's ability to heal or correct the body's nervous system". In the womb, only two per cent of Noah's brain had developed and he also was found to have spina bifida. His brave parents refused to terminate the pregnancy five times. 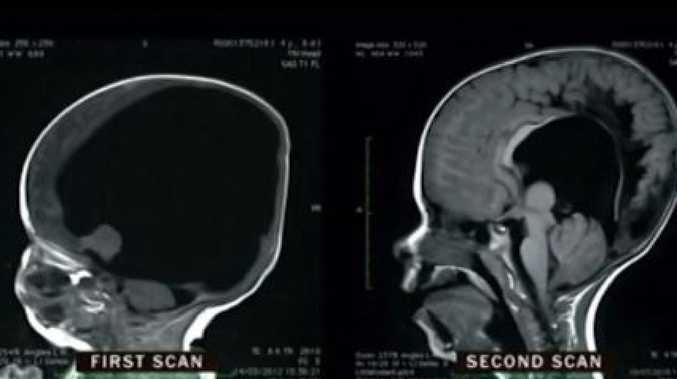 At the age of three, another brain scan found dramatic brain growth - this time with 80 per cent brain mass, a development that's baffled the medical community. Mr Wall said that many medics believed there was no brain there in the first place. 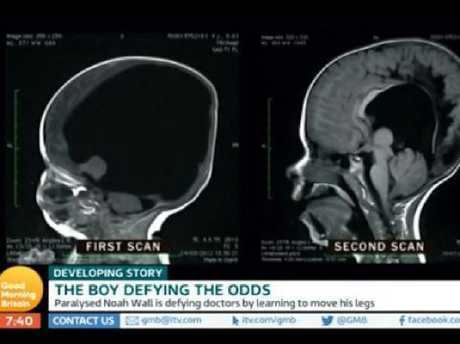 Yet others believed that the brain had actually just been squashed into a small space - and that after Noah had a shunt fitted, it grew back to where it should have been. 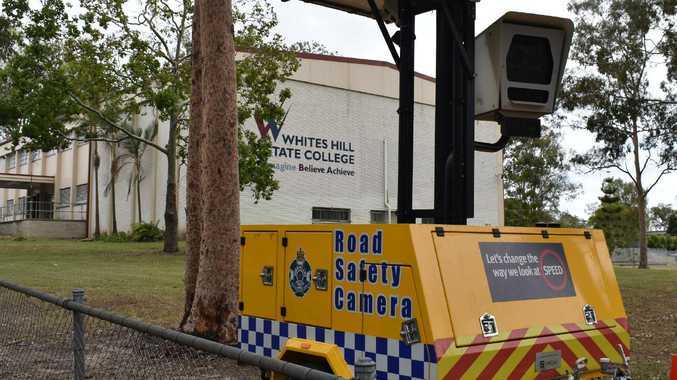 "Even if his brain had been so squashed up, he'd be severely mentally disabled because of all that damage and look at him - he's as bright as a button," said Mr Wall. He said that because they were older parents, the couple was more resistant to doctors' calls to terminate the pregnancy. And it's paid off big time. Doctors told the parents that Noah would be severely mentally disabled - unable to talk, see, hear or eat. But the six-year-old can do all of those things. "We waited with bated breath and they put a 'Do Not Resuscitate' notice on Noah," recalled Mrs Wall, who is a mum-of-three. The doctors who initially saw Mr and Mrs Wall in the UK admit that the plucky youngster is "extraordinary".